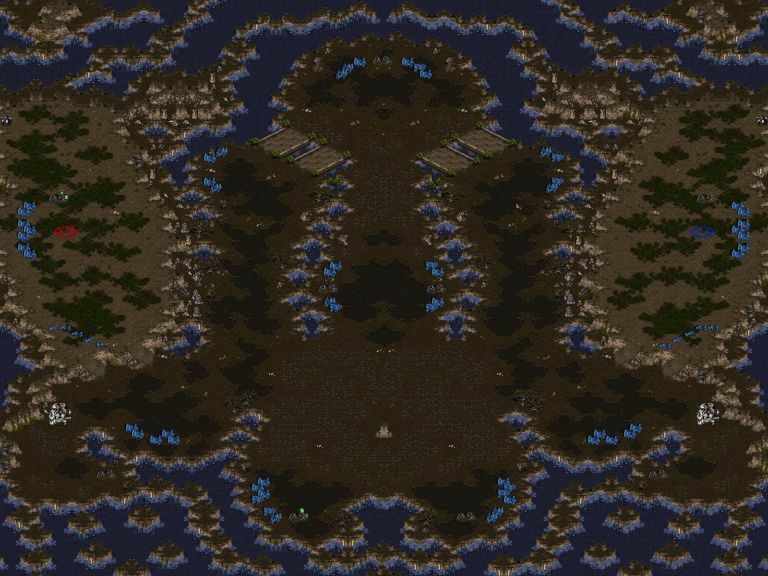 This week's MOTW comes from trcc, veteran mapper here at broodwarmaps.net. (4)Greedy Weakness is a well executed map, easy on the eyes, great layout, and has no major balance issues (which is always a plus :D). A new idea was incorporated into this map which catches my eye is the in-base Natural. The most unique part about it, is that there is easy access to the mineral line for opponents to harass, creating interesting opportunities early game and mid game. This week LGI's (modified by spinesheath) (4)Atma gets the win for Map Of The Week 2006.35! This semi-air map is executed with great skill, which is no surprise from LGI. It's layout was done very well and should play with great flow! This map shows great potential, and should host many great games. Download it, and give it a try! Epidion takes this week's MOTW title with his innovative space two-player space map Echo II. As the walking distance between the base is rather big, playing an early expansion strategy should pay off pretty often. There is no other expansion that you can grab just like this on the map, though, so it should not become too much of a macro war. Also the total amount of expansions is rather low too (eight), I personally appreciate that on a two-player map a lot. Enough talking, start playing our newest addition to the MOTW-list, get it right now! flothefreak is the happy guy to get the MOTW award this time for his pretty experimental map Naja. He may also win the strangest-map-name award on this one by the way. 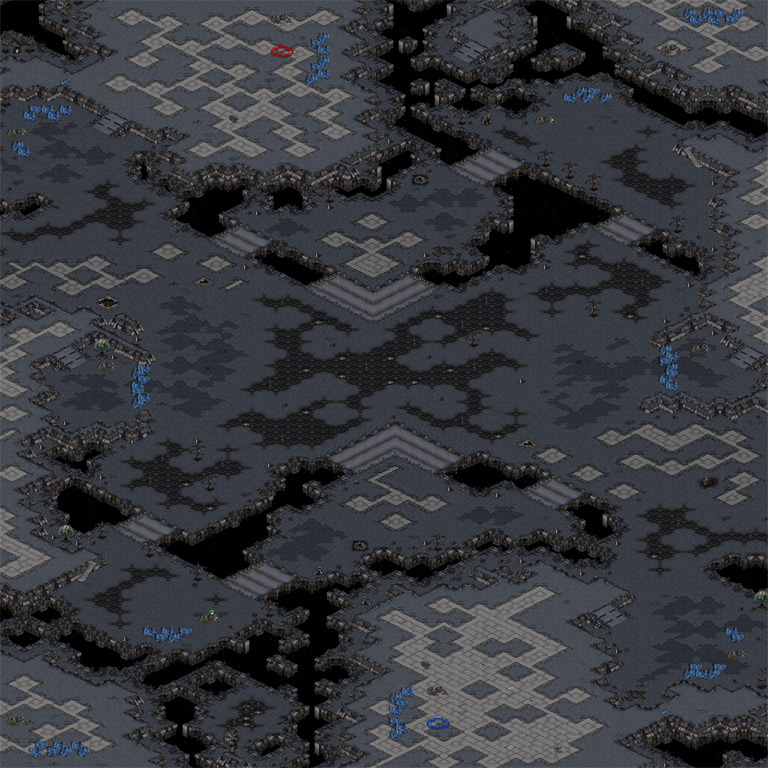 The secound entry to the main on ths two-player map is blocked by a mineral wall, while the natural is pretty exposed, making fast expo strategies pretty hard to pull off. This week's Map of the Week, (4)Nazca, is from GRC-Deathlink and what a great map to pick! The map has an almost perfect layout; not too tight, not to open, expos placed well, inverted ramps are clean. The map is very original and well though out. You've done something that i was trying to do long ago! Lot's of kisses and i will surly push this map as far as i can! WOW! Looks really cool, and you've got three exits from the nat, that's awesome. I'm very impressed.